Dom Bouffard is a musician and composer from London. 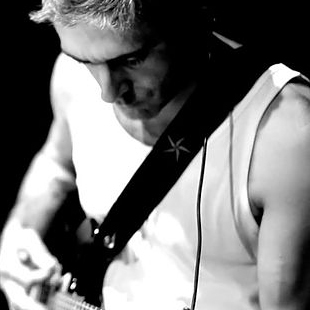 From 1997 to 2006 he played guitar with Alt Rock bands Sona Fariq and Queen Adreena, touring internationally with artists including Marilyn Manson, Sonic Youth and Public Enemy, and collaborating with producer Jagz Kooner (Primal Scream) on remixes for artists including Massive Attack and Kasabian. He has since worked as a performer and arranger on the Robert Wilson/Berliner Ensemble productions Shakespeare’s Sonnets (2009) with Rufus Wainwright, and Lulu (2011) with Lou Reed; composed two Wilson radio plays (Monsters of Grace II and Tower of Babel for ARD/BBC), and Flying — a video portrait featuring Lady Gaga at the Musée du Louvre. Dom’s work, which also spans lm, TV and fashion, includes his radio piece WW1 (2015, hr2) which was nominated for the Karl Szucka and Kriegsblinden Prizes, and several dance works with Marianna Kavallieratos: Recalculate (2013), Stations (2014), dance lm Metal Mark, and installation 4WALLS (2016). He is also a singer-songwriter with Alt Country/Punk Blues duo Emperors of Rome.